Elizabeth Shaw is an Advisory Manager at KPMG as well as being the Australian President of UN Women. At a time when the spotlight is on what divides our politicians between (and within) parties, it is important to remember there are values and principles that unite us as Australians. Pursuing gender equality is not just something that we do because it is right. It’s not just something we do because it’s smart. We commit ourselves towards pursuing this, and we invest in this, because it’s part of who we are. We are a country that prides itself on creating opportunity. We believe in a fair go. And we can’t fulfil our national objectives of driving productivity and innovation without harnessing women’s full potential. As we’ve heard from the Prime Minister and party leaders, there is much more work to be done. And the challenges: violence against women, economic security, and women in leadership roles are immense. They require long term commitment, visible leadership, meaningful investment and alignment across portfolios. But they are not insurmountable. I want our next generation of children to grow up in a country where a female Prime Minister isn’t remarkable, where domestic violence is unheard of. A country where both women and men work flexibly to raise children and care for family, where there is no gender pay gap, and where gender equality is business as usual. And I know you want this too. I wish this not only for Australian children, but children around the world. But the reality is, while we continue to make progress in Australia, around the world women’s rights are heavily politicised, and are often a matter of one step forward, two steps back. Recent events show it is all too easy to slip backwards. Backward in how we talk about women. Backward in their rights. The mass mobilisation of women and men on the streets in January over decisions by governments demonstrates a shared global expectation: that women are involved in making decisions that affect them, have access to reproductive health services and live lives free from discrimination and sexual violence. For millions of women and girls in developing countries, UN Women fights to make this a reality, thanks to the support of donor countries like Australia. It is a time in our world where countries are starting to look inward – and it is more important than ever before that Australia look outward, and recognise our fortunes are tied to that of our region. I am grateful for Australia’s renewed commitment to UN Women. It is important that all of us – MPs, Senators, Secretaries, our Defence Force, civil society leaders understand the value of Australia’s foreign aid program, even in challenging financial times. 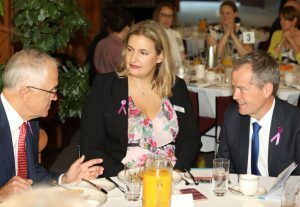 Without these programs and the commitment of all Australians, economic, health and education opportunities would only be a dream for many women. On International Women’s Day, it’s time to #BeBoldForChange and as UN Women advocate, “Empower a Woman, Empower a Nation”. Sign the International Women’s Day pledge today.